A traditional starter that has its roots in southern Italy, this is a firm favourite with our guests in Puglia and Amalfi. 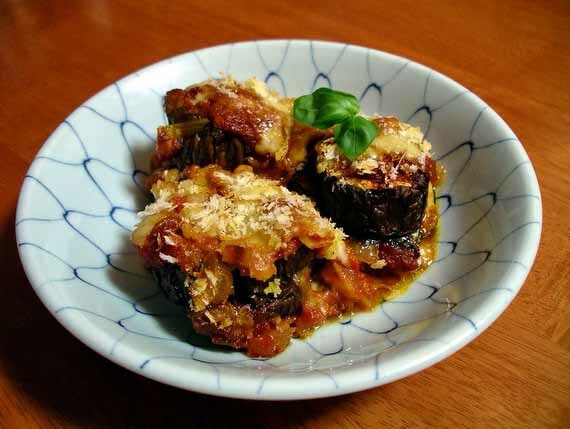 This succulent aubergine bake is a great way to kick off any Christmas dinner! Warm up a tablespoon of oil in a pan and sauté the onion, stirring continually. Add the tomatoes and cook on a middle/low heat, for twenty minutes. Add 4 basil leaves to the tomato sauce when cooked. Then sieve the sauce through a thin colander, pressing the large pieces of tomato with a wooden spoon, so you get all the liquid. Heat up plenty of oil to fry. Coat the aubergines in flour and fry until golden. Then lay on kitchen paper to remove the oil in excess. To assemble dish, use a large baking dish and pour in the remaining oil. Begin with a thin layer of tomato sauce and then alternate layers of fried aubergines, diced mozzarella, tomato sauce and Pecorino cheese. Continue to alternate aubergine, mozzarella, sauce and parmesan until to use up all the ingredients. On the last layer pour only tomato sauce. Bake for approx. 20- 30 minutes at 200°C. 8. Before serving, add the remaining basil leaves to decorate.